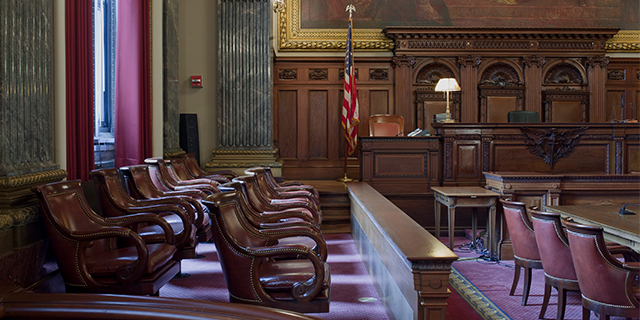 The chances of serving on a jury in any given year are small, but most Americans still see it as part of being a good citizen. Majorities in most demographic groups connect jury duty service with good citizenship, but younger people, racial and ethnic minorities and those without a college education are less likely to do so. For example, only half of those ages 18 to 29 say jury service is part of being a good citizen, compared with seven-in-ten or more in older age groups. Blacks and Hispanics are less likely than whites to see jury duty as a part of good citizenship, as are those with a high school diploma or less when compared with people with at least some college education. When it comes to the number of Americans who actually serve on a jury in a given year, recent statistics are hard to find. But the National Center for State Courts, an independent research organization focused on the state judiciary, has estimated that only about 15% of U.S. adults receive a jury summons each year, and fewer than 5% of those who are summoned end up on a jury. The center’s 2007 estimates are based on a survey of 1,546 counties, representing about 70% of the U.S. population at the time. In fiscal 2016, federal courts called 194,211 people for petit jury duty, down 37% from 307,204 in fiscal 2006. 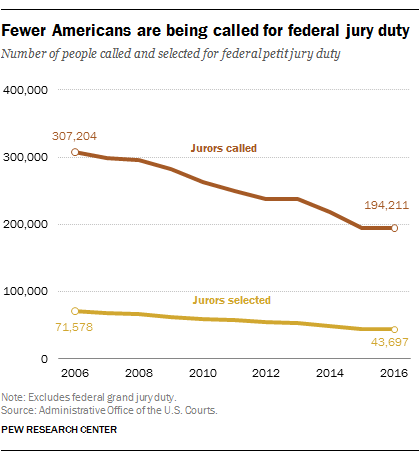 And 43,697 people were selected for federal petit jury duty, down 39% from 71,578 a decade earlier. The decrease in jurors tracks a broader decline in the number of federal jury trials: In 2016, just 2% of 77,318 total federal defendants had their cases decided by a jury, half the total in 2006.